Big companies. Small companies. Private. Public. For-profit. Nonprofit. Manufacturers. Tech shops. Banks. Hospitals. Retailers. You name it. They all want to do right by their employees. To be a place people want to work. To support work-life balance. To pay a fair, living wage wherever possible. As a provider of employee discount programs, we hear employers talk about this every day. It’s an encouraging sign that most organizations are looking to make their workplace a better place. And yet, we also hear about the grumbling of employees who are increasingly dissatisfied with the wages they receive. We read articles about the shrinking of the middle class and how even families with two incomes are struggling to make ends meet. So where’s the disconnect, between companies that are genuinely concerned with the well-being of employees and the employees themselves who view their economic reality in a very different light? To help answer this question, we took a closer look at the numbers behind employee compensation in America. What we found were some eye-opening facts that may well explain the growing unrest and dissatisfaction in the workforce. 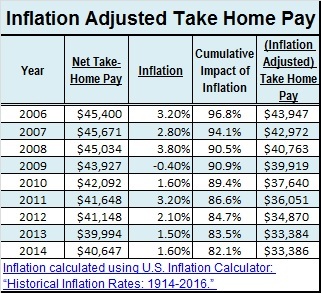 Between 2006 and 2014, the average U.S. household saw its take-home pay drop by more than 10% – and nearly 25% if you factor in the impact of inflation. Perhaps not surprisingly, the primary culprit has been the rising cost of health coverage for those lucky enough to afford it. And while recently released U.S. census data revealed some long-awaited wage relief in 2015, American workers still find their purchasing power still sharply below where it was only a decade ago. Where has our purchasing power gone? Our research, conducted using publicly available data from 2006-2014, weighs average wage levels against the impact of federal taxes, employee-paid health insurance premiums and out-of-pocket medical deductibles. 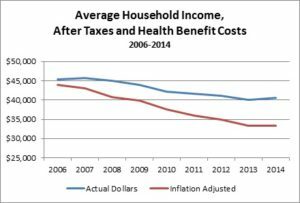 Compiled from government and healthcare industry sources, the research showed that while tax rates remained effectively constant over the 9-year period, deductions for health premiums increased 62% and deductibles – the amount employees are responsible to pay before benefits kick in – soared by another 108%. The result was a cut in annual discretionary income of nearly $5,000, or 10.5%, for the average U.S. household. Worse still, this research may actually underreport the cost of out-of-pocket deductibles since only data for individual coverage, not family coverage, was available. 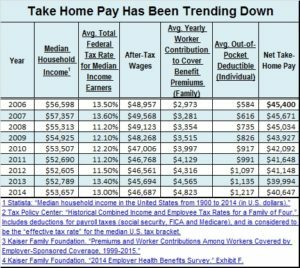 Given that deductibles are almost always higher for families than for individuals – frequently by doubl e – their out-of-pocket impact on take-home pay was almost certainly higher. The research did not include cost trends related to co-pays, coinsurance and drugs or procedures not otherwise covered by employer-sponsored plans. The drop in purchasing power gets worse when taking inflation into account. Despite rates that have been at or near 50-year lows, the average U.S. household watched as inflation eroded the value of its discretionary income by a whopping 24% in the years between 2006-2014, as shown in this chart. 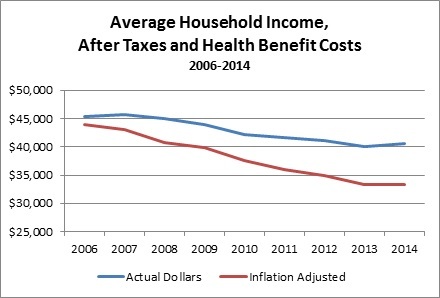 Depicted visually, the shrinking of discretionary household income can be seen following a steady downward trend. 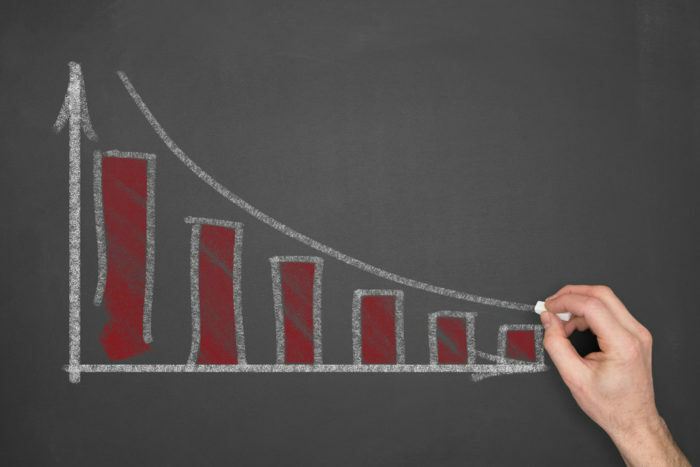 If there is any good news to be had, it’s that the most recent survey released by the U.S. Census Bureau reports that U.S. household income enjoyed a notable bump in 2015, increasing 5.2% to $56,516. 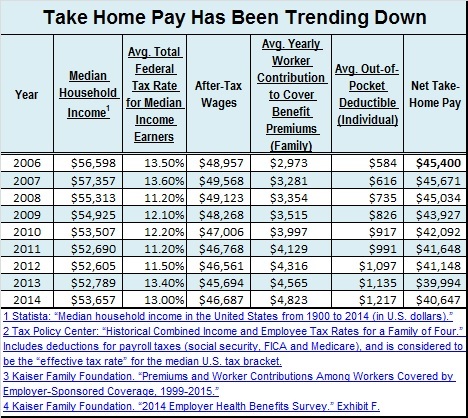 Because average total federal tax data for 2015 has not yet been released, the net impact of the increase on take-home pay remains to be seen – though additional gains will still be needed to match historical levels of household income. The effects of these lost wages appear to be far-reaching – on employees and employers both. According to the most recent Employee Wellness Survey conducted by PwC, nearly half of all employees (and 72% of adults overall) reported feeling stressed about their finances. In another survey, the Federal Reserve Board found that roughly the same number would have trouble covering a financial emergency of as little as $400. This growing financial anxiety has been linked to recent increases in depression and suicide, as well as reduced employee engagement, productivity and absenteeism. Financial strife has also led many to forego needed health care. In a recent Commonwealth Fund survey, four in 10 under-insured adults reported not getting care they needed due to cost. And in a study by the Associated Press-NORC Center for Public Affairs Research, 47% of middle-class workers have either skipped healthcare services or experienced financial hardship over medical expenses. Student loan assistance– Employers looking for long-term retention of their best workers, and millennials in particular, need look no farther than their student debt accounts. With total U.S. student debt at over $1.2 trillion and the average graduate carrying student loans of over $33,000, the impacts are real and the opportunities are abundant.Helping employees pay off or even refinance their college loans is something that many businesses are in a better position to do than employees themselves. And if you’re worried about highly educated employees taking the money and their talents to greener pastures, you can always condition your financial support on longer-term employment arrangements. Food in the office — Given that most of us eat three times each day, it’s not surprising that food comprises a significant portion of most family budgets. And yet, it’s amazing how cheaply one can feed a large group armed with not much more than a Costco or Sam’s Club card.Keep in mind, we’re not talking caviar and truffles served with a side of gold leaf. For a few bucks a month, you can keep a small staff loaded up with oatmeal packets, peanuts or granola. You may not win any culinary competitions, but employees on a budget appreciate the option of skipping the occasional $5-$10 lunch in favor of a power bar or two. Whatever you choose to do, it’s important to be aware of the unique needs of your workplace and to keep up with the latest trends in healthcare. Self-insuring, hybrid plans, telemedicine, wellness initiatives, and smoking cessation programs – these are all options for reducing costs and helping employees keep more pay in their pockets. In return, employers can help overcome the cycles of hardship that have increasingly hampered workplace productivity, depleted morale, reduced overall well-being and negatively impacted profits. It will take some doing, of course. Employers will first need to recognize the problem within their own workforce, then commit to doing something about it – even if it takes a little creativity. And the great thing about creativity is that it doesn’t have to cost a thing. Andrew Graft is a 20-year communications veteran with a passion for analytics. He holds dual degrees from Utah State University in economics and business management, as well as an MBA from Westminster College of Salt Lake City. Andrew serves as vice president of corporate marketing for Access Development – provider of America’s largest employee discount network: Access Perks. For more information click here.